If you own a digital camera, you may have noticed that after you've come back from holidays that your timestamps are incorrect. That can happen for many reasons, most often being a dead battery and not resetting the correct time. With EXIF Date Changer, you can quickly update photos so that they include the correct time and date. 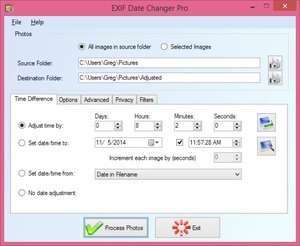 EXIF Date Changer is basic and includes running the program and feeding it images from a folder. Version 3.5.5.15102 is a freeware program which does not have restrictions and it's free so it doesn't cost anything. For security reasons, you should also check out the EXIF Date Changer download at LO4D.com which includes virus and malware tests. Additional screenshots of this application download may be available, too.